The Topeka TCF Chapter holds monthly support group meetings on the fourth Monday of each month (unless otherwise noted in the newsletter and/or on this website) from 7:00-8:30 p.m. We meet in the Formation Room of the Most Pure Heart of Mary Church, 3601 SW 17th St., Topeka, KS. Upcoming Meetings Scroll down to the bottom of this page for a map showing location of Most Pure Heart of Mary Catholic Church. The Topeka TCF Chapter is not affiliated with any religion, but simply utilizes meeting space that has been generously provided by Most Pure Heart of Mary Parish. Triggers are sights, words, events in our surroundings and daily activities that touch our grief and bring it to the surface in sometimes uncontrollable ways. Triggers can be memorabilia, places, objects, songs, smells, people, or anythung that brings back memories.Let’s talk about what our “triggers” are, how they affect us, and how we handle them. Are our “triggers” always painful or do they sometimes bring plesant memories to mind? This meeting will offer us the opportunity to discuss our “triggers” and they part they may play in our individual grief journeys. At this month’s meeting we will have the chance to talk about unusual happenings we may have experienced since the death of our child, grandchild or sibling. Bereaved people often talk about something that has happened to them that made them feel as though they were somehow contacted or felt more connected to their deceased loved one. Sometimes dreams about our child can be comforting, sometimes unsettling.This meeting will offer us the opportunity to share any such events that have happened to us in an open and non-judgemental setting. This meeting offers each of us an opportunity to share something about our child, grandchild or sibling. Plan to bring a story, a poem, some music, a piece of clothing, a book, a photograph, or a toy--anything that you would like to share that relates to your loved one. In our group we understand the importance of remembering and being able to talk about our children in a loving and supportive atmosphere of acceptance and non-judgement. As we get to know each other, let's also get to know each child's story, their likes and dislikes, their favorite thing to eat, whatever you would like to share. Topic: What Makes Me Angry? Anger and Guilt are two emotions often felt by people who are bereaved. Anger at the unfairness of the death or possibly with an individual who may have contributed to the death, even anger at God. One may feel guilt that somehow they did not do all they should have to protect their child, grandchild or sibling and keep them safe. While both anger and guilt are valid emotions that need to be recognized and respected, they are also emotions that can become stumbling blocks on the road to healing. Holding on to anger and guilt - which does not change the fact that your loved one died - can make it difficult for you to do your grief work of acknowledging the reality of the death and processing the many emotions that you may experience on your journey. Let's talk about anger and guilt and discuss strategies for handling these emotions. Please Note: Because the MPH Parish Center will be closed for maintenance during our July meeting time, we will be meeting in the St. Vincent Center south of the Parish Center and School building. Follow the signs to the entrance on the north side of the building. We will be meeting downstairs in the basement area. Information on date and this event will be posted in the coming months. The Steering Committee is currently exploring several possibilities for a special memorial event. Look for information on this website and in our Chapter Newsletter. A special Memorial Event generally takes the place of the regular monthy support group meeting in September. Please plan to join us for this special event to honor the lives of our children, grandchildren and siblings who “left too soon”. You are asked to bring a framed desktop photo of your loved one (if you do not have photos, plan to bring something that represents them to you). During the Candle Lighting we will share special music, poetry and each person will have an opportunity to light a votive candle in memory of that special life and place that candle by their photo/memento. After the Candle Lighting we will have a time for fellowship and refreshments. You are encouraged to bring your or your child’s favorite holiday treat to share with the group. Votive candles are provided. PLEASE NOTE DATE CHANGE: This event takes the place of our regular December support group meeting. INCLEMENT WEATHER NOTE: We try never to have to cancel a meeting, however if the weather is severe, please check local media outlets for cancellation announcements. Generally in winter, if USD 501 has cancelled school because of unsafe driving conditions, our TCF meeting will also be cancelled. 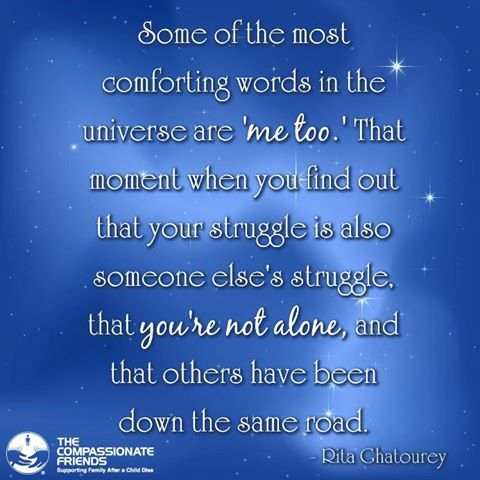 A Compassionate Friends meeting offers the opportunity to speak freely about all parts of the grief experience. We ask only that the participants observe some basic ground rules designed to make everyone more comfortable and secure. We want these meetings to be a “safe haven” for all those grieving the death of a child, grandchild or sibling. The group offers the freedom of complete honesty. Say whatever is in your heart – not what you think others want to hear. Tears are a necessary and important part of the healing process, and a Compassionate Friends meeting is the one place you can cry as openly as you wish. Everyone here understands in a very special way. Accept each person just as they are – regardless of what they say or do. Each person’s grief experience is unique. No one should be shocked or impatient with anyone else. The opportunity to be sensitive to the needs of others is a healing and growing experience. We know we are making real progress when “our mirrors start becoming windows”. We encourage everyone to share something during the discussion. Sometimes memories are simply too new and painful, emotions may be too strong to enable us to speak. Please know that we understand if you choose not to speak for whatever reason. You are never required to participate if you don’t want to - much may be learned by just listening. Everyone should have an opportunity to share during the discussion if they want to. Try not to monopolize the conversation. Some of us may need to talk more at different times; each meeting is unique in this respect. Attending a Compassionate Friends meeting does not obligate you to a single thing. You have the freedom to attend as often or as seldom as you wish. You may wish to continue coming to meetings as long as you feel you are being helped or are reaching out to help the more newly bereaved. TCF is non-denominational and non-sectarian. 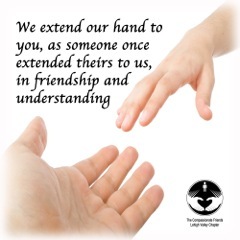 We care for ALL bereaved parents, regardless of race, religious creed, social status, age or language. It makes no difference if your child was young or old or what the cause of death may have been. We are a family broken by grief, but mended by love. There are never any individual dues or membership fees to participate. 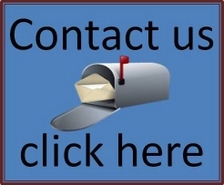 We do have some financial needs, such as the newsletter and special memorial events, but they have to be met through voluntary contributions, love gifts, and fundraising efforts. Please respect the privacy of each person who comes to our group. Please do not share what you hear at this group with friends or family. Everyone must agree that all information shared within this group, stays within the group and will remain private and confidential. It is important to create an atmosphere of trust in order for us to be able to share our deepest emotions. We will hear many heartbreaking stories during the meetings. You should not add their sadness to your own, but understand that such opportunities to share are an important part of the healing process. If this is your first meeting, you may feel overwhelmed, but please try to attend at least three meetings before you decide if this group will be helpful for you. Each month we will cover a different topic that may help you on your grief journey. Be aware that some people may actually feel worse after their first meeting – this is likely because they have had the opportunity to come face-to-face with the reality of their loss. Please do not let this discourage you from trying another meeting. It takes courage to attend, but the benefits can be enormous. We want everyone to be as comfortable as possible at the meetings and therefore keep them informal by design. If you need to get up and walk around or take a small “time out” by leaving the meeting for a few minutes, that is perfectly OK.
Our meetings are non-smoking meetings. If you wish to smoke, please step outside the building to do so and please do not leave cigarette butts on church property. We ask that you either turn off or turn cell phones and pagers to “vibrate” mode during the meetings. We realize that sometimes you need to be reachable by phone, but we do not want to disturb the discussion by having phones ringing. We make every effort to officially break the meeting at 8:30 p.m. for those who may need to leave. However, we invite you to stay if you like to have refreshments and have time to get to know the members of our group. 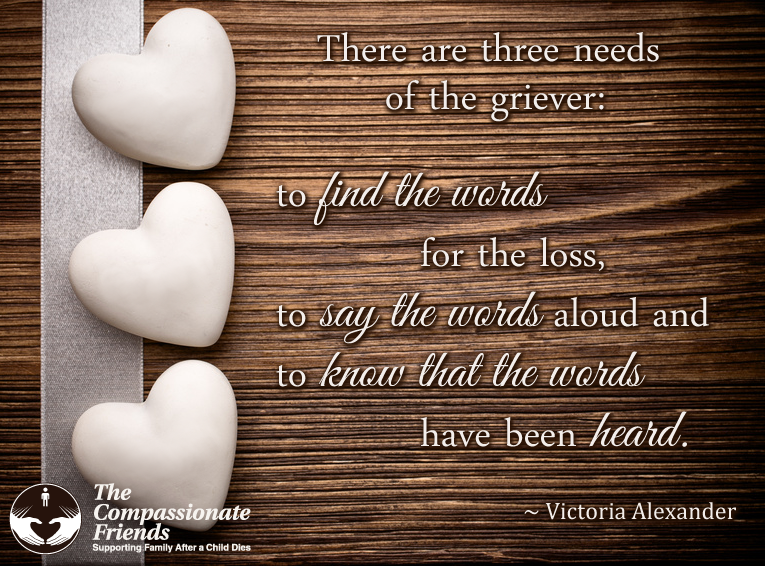 We are each other’s greatest source of support, for we understand as others cannot, the depth and complexity of the grief experience following the death of our beloved child, grandchild or sibling. Chapter meetings are open to all families that have experienced the death of a child, at any age, from any cause. Regardless of our child's age, we in TCF believe our children will always be thought of as just that...our children. Yes. We all grieve differently and your spouse or significant other may not be ready to take part just yet...or ever. Some meetings we simply introduce ourselves and share our thoughts and feelings. At other times, chapters have short programs before or after the sharing time. The programs may include a brief guest speaker, viewing a videotape, or listening to an audiotape or CD. Chapters usually have special months when they hold a balloon launch or have a memorial candle lighting. While we understand the difficulties of finding childcare, we must ask that any children attending with you be old enough to understand the meeting discussions and not be upset by them. Some chapters have sibling groups for children twelve or older; check with your local chapter. Often, the first meeting brings a lot of emotions to the surface and this may make the first meeting difficult. Some say that they bring home the pain of others after listening to their stories. Attending three meetings gives you time enough to allow your emotions to even out and to understand that in sharing there is healing. We meet in the Formation Room of Most Pure Heart. It is best to try and park in the west parking lot in front of the brick building that is adjacent to the church itself. Walk up towards the covered walkway between the church and this building and enter through the door on the north side. There will be signs beginning at that doorway that will direct you to the Formation Room meeting site.